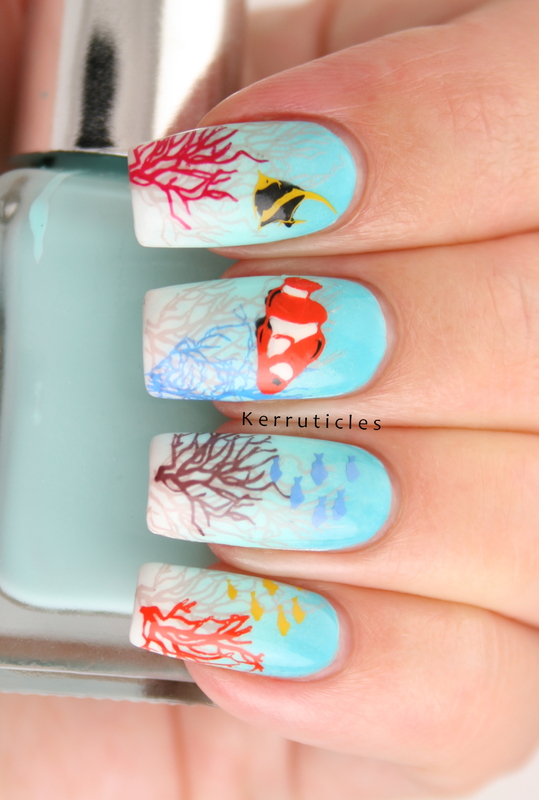 These coral reef nails are for the 40 Great Nail Art Ideas group, whose prompt this week is “Things In The Water”. 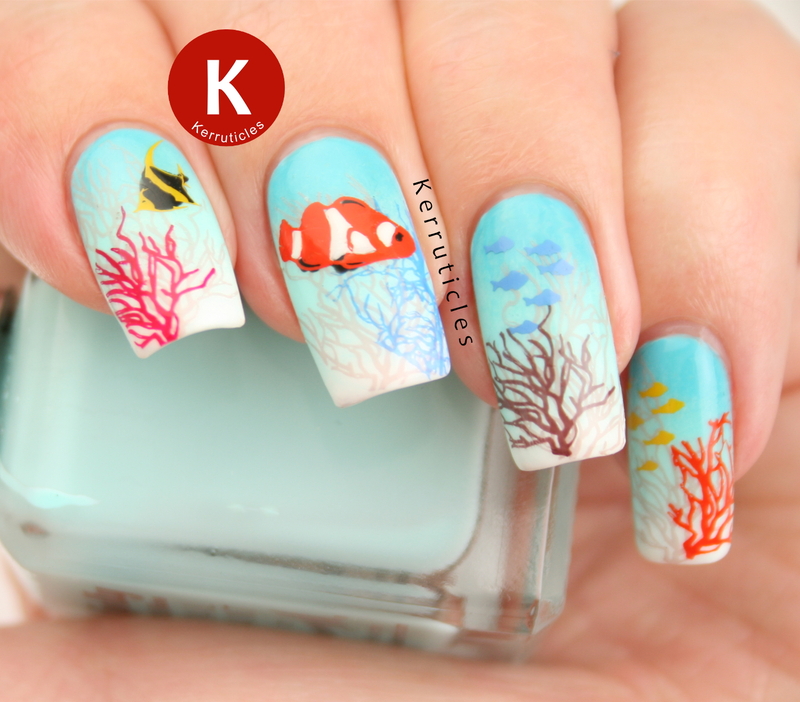 I decided to use some images from the Bundle Monster Sun Kissed stamping plate collection to create an underwater scene. Firstly, I painted the gradient background using Barry M Cotton, Barry M Sugar Apple and Barry M Turquoise. Then I added various coral reef images. On each nail I stamped a spindly coral using Barry M Almond. 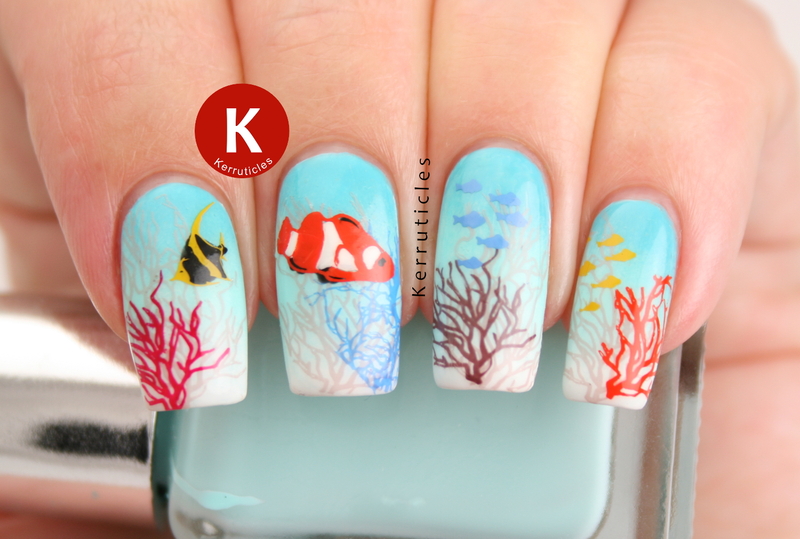 Because this isn’t a stamping polish, it’s great for use in the background like this. Then I added some more coral, using Mundo de Uñas 13 Orange, 42 Holland Blue and Barry M Blood Orange (the red on the index finger) and Barry M Cocoa (medium brown). I made a couple of decal fish: a clown fish and an angel fish (well, it’s a Moorish Idol to be precise) and also stamped some other shoals of fish on. I also added an orange crab but really didn’t like it. It seemed a little comical. Plus, little crabby felt like he’d be more at home at the seaside than crawling around a tropical coral reef. So I was delighted to discover that it came off in one go with my lint roller without disturbing any of the other stamping. Complete result. Nella Milano Raven Wing was previously sent to me for review. All views expressed in this post are my own, honest and unbiased opinions. 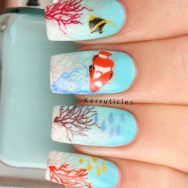 Amazing coral reef nails these are. The details in it is awesome.